On this #DamnItCarl podcast B.C. 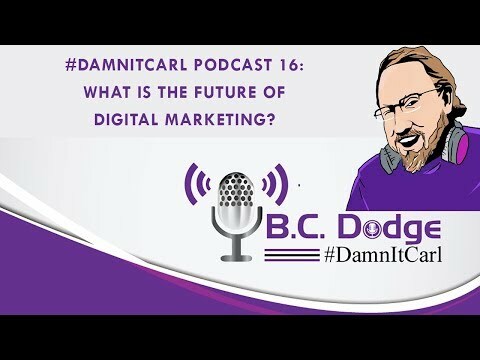 Dodge asks – what is the future of digital marketing? Since the 1950s we have been promised a better future of flying cars and better service, and a simpler life thanks to technology. And in 2018 we have self-driving cars that kill us and cheap food that is heated using microwaves and is more than likely going to kill us all. This information isn’t being shared to depress you, but to show you that the timeline we want may not be realistic. Yes, there are companies out there that are working on the next big thing, like the next Google Glass (and there will be a next Google Glass) and the part that digital marketing will play in this will be to figure out how to use this technology to get the ads in front of you. B.C. references a video called “Hyper-Reality” posted by Keiichi Matsuda in the video we follow a woman who is using “smart glass” and we can see all the ads that she is exposed to. B.C.’s favorite part of this video is when she is in the super market and she gets the pop-up ads for what fruit she should buy and why. It is also in this section of the video that her smart glasses start to go on the fritz and we can see how digital marketing goes so far as to change the way a simple yogurt cup looks based on who is buying it.